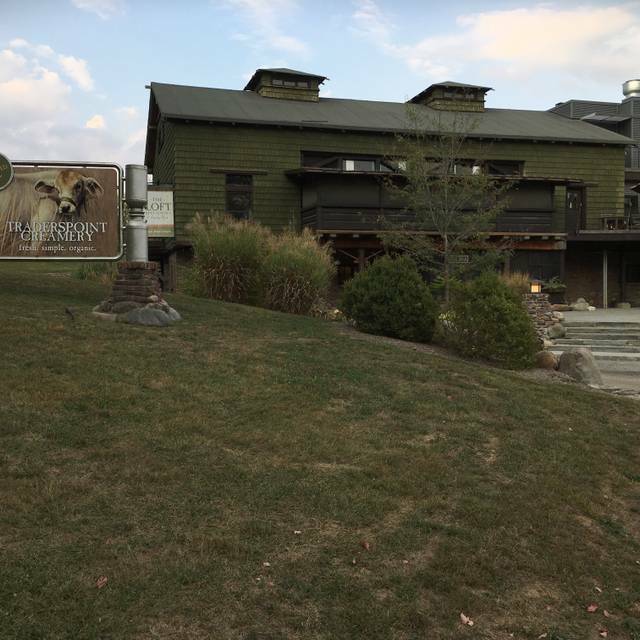 You must make reservations at least 5 minutes in advance of the time at The Loft at Traders Point. Featuring live music every Friday night! 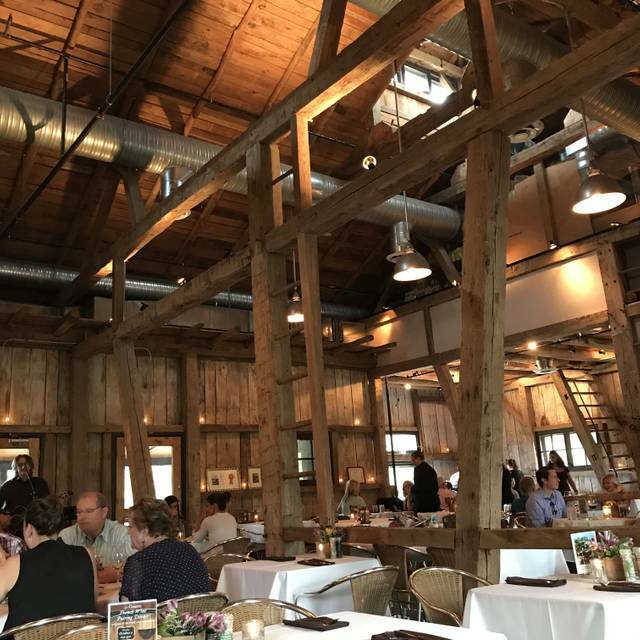 "The Roost," perched atop our historic barn and Loft restaurant, with stunning views of our organic dairy farm, is a beautiful private event room that accommodates both private and corporate events. 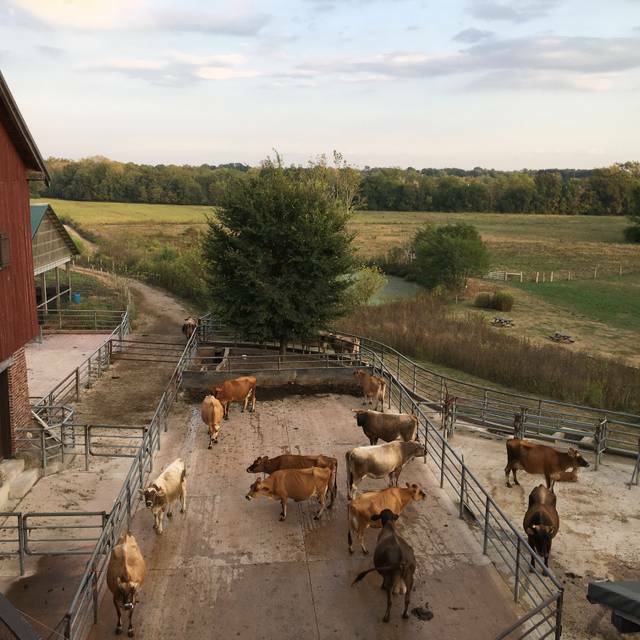 Large windows and a wrap-around balcony offer a picturesque view of the pastures and woods where our dairy cows graze. The Roost’s interior combines rustic and modern styles for an atmosphere well suited to a wide variety of occasions. The unique handcrafted fireplace and wood interior make a cozy and sophisticated setting for gathering with friends, family, business associates, or clients. With the addition of the adjoining lounge, overlooking The Loft’s dining room, The Roost can accommodate up to 50 guests. The intimate space can be arranged to suit a wide range of needs, including groups who require AV equipment. 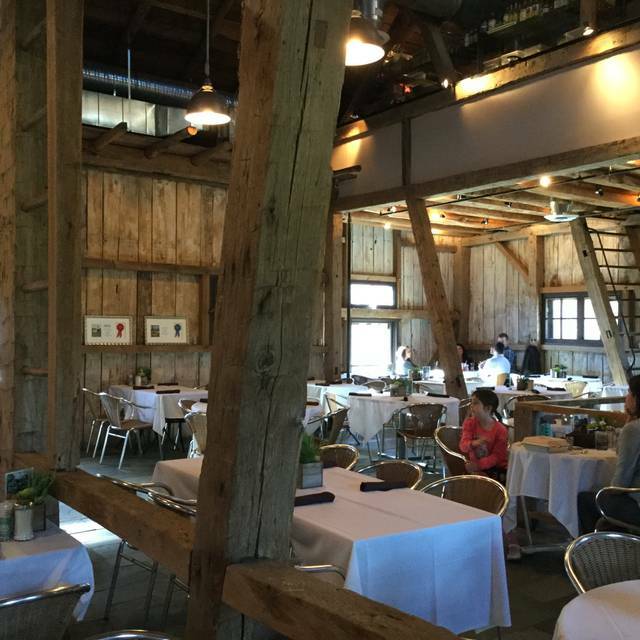 Indiana's only organic farmstead restaurant! 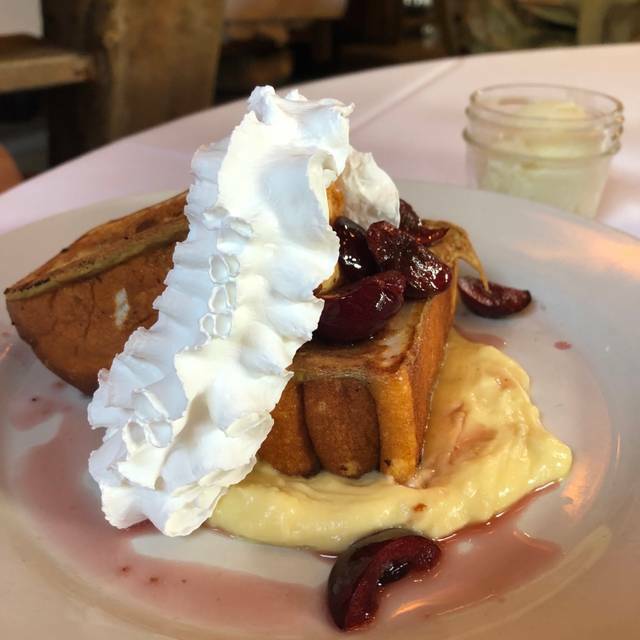 Serving Lunch and Dinner including our Award Winning Brunch on Sundays. 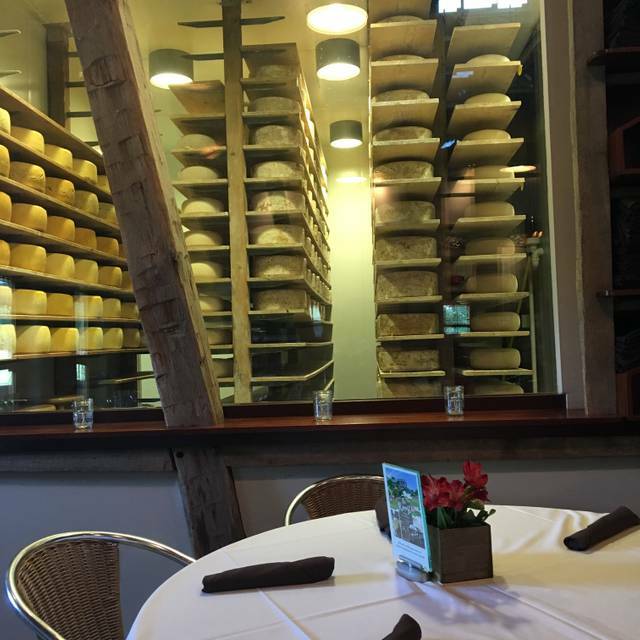 Our menus feature our award winning cheeses, yogurts and ice creams, along with our own 100% Grassfed Beef and pastured pork and chicken. We proudly serve other fresh food from local growers and artisans. Our culinary team proudly serves hand-picked herbs and vegetables from our own garden. Enjoy live music during dinner every Friday night! Private and custom events accommodated in The Roost, our private event room overlooking our farm. 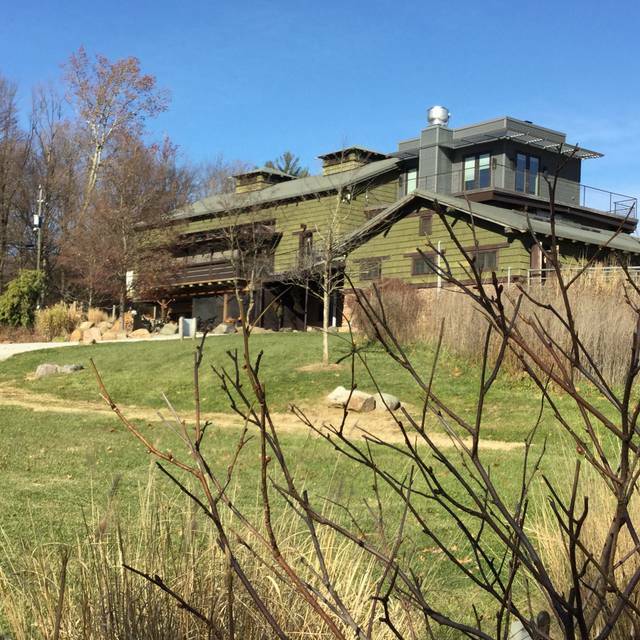 A seasonal farm-to-table menu with organic, grassfed, and local ingredients! bibb lettuce, mint, snap peas, fennel, pickled red onion, Sheet's Creek cheddar, spring onion green goddess. Choose grilled chicken breast or grilled salmon. The Loft at Trader’s Point is always a delightful experience. We enjoyed a delicious family Eater brunch. It offers a quaint environment, unique and tasty menu and great service. And no matter always make room for their cheese board as an appetizer! The selections of entrees, salads and appetizers is great. The waitress service is also first rate. And the atmosphere is excellent. On the other hand, with a reservation at 7:15 we were finally seated at 8:00 PM. A forty five minute wait with a reservation is POOR and a real negative for going back soon. One last issue was the ice cream. My wife and I both had sundaes and the ice cream was NOT creamy. You’d think a restaurant with creamery in its name would have creamy ice cream! We politely mentioned it to our server and she offered to pass it along to management and charged us for only one sundae, which we thought fair . Always a wonderful meal, great atmosphere and smart choice. Outstanding! Great restaurant. Would recommend to anyone looking for Farm fresh meal. A little pricey, but great for any special occasion. Amazing food, fast service, lovely ambiance. And eating on the screened-in porch is so fresh and relaxing. Took almost an hour to get our food. The dessert that was supposed to be hot was cold. Have had good experiences here in the past so this was disappointing especially bringing people for the first time. We were in town for a soccer tourney and happened upon this place in open table while looking for a last minute place after a long drive. Seated us early- thank you! The food was fantastic. Had an asparagus salad that should be saved in a time capsule or a museum. It was ridiculously amazing!! Farm is quaint and very well kept. Great experience. Everything was great yesterday at The Loft for lunch. The food was delicious, the service was very good, and it was delightful sitting out on the screened in porch. Marilyn L. ( the hostess) could not have helped us more that she did. We had two handicapped persons in our party and Marilyn was absolutely outstanding in her treatment of us. She definitely is a "keeper". Server was less than enthusiastic... perhaps because it was a Sunday .. Ordered a mimosa, the prosecco was flat.. This was our second time dining here, the first was much better. We had a wonderful dinner with amazing service and spectacular food! We love this place. 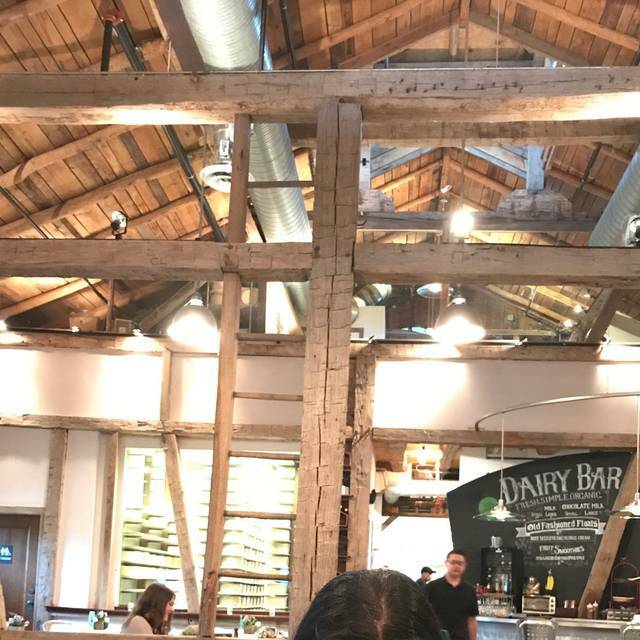 We feel blessed that Trader's Point Creamery and The Loft are close to our home in Zionsville. It is a special experience any time you go. Huge thanks to the owner and staff for creating a destination of it's own. It's great for family to explore too before or after dinner. Great food as usual - the new spring menu! We ate out on the porch and it was so nice. Great food and gorgeous atmosphere! Small portions are the only complaint. Everything else was perfect. Chicken, trout, burgers all excellent. Portions are large, vegetables well cooked and of course desserts are excellent. Brunch well done. I enjoyed my mixed salad with grilled salmon. The salmon was perfect. Salad a bit over dressed and salt level a little high. Salad ingredients were very nice, Bib lettuce, radishes, snap peas, shaved fennel , green goddess dressing. My bloody mary was a little spicy and I like spicy. Daughter and husband had the grits with mushroom gravy. They thought it was delicious. Server was bubbly and attentive. Ice cream was disappointing. Icy and lacking in flavor. We had a great time shopping in the local market downstairs. Purchased a beautiful cheese board and some cheese. What an awesome memory for our 5th wedding anniversary! This was a totally different experience than doing the usual downtown dining. While it was pretty pricy, it was well worth it for our special occasion. The service was outstanding & the food was beyond measure! The setting alone on a farm just made it so unique. The quaint little farm fresh food & gift shop was a bonus! We absolutely loved everything about The Loft! Can’t wait to go back! Fantastic meal. 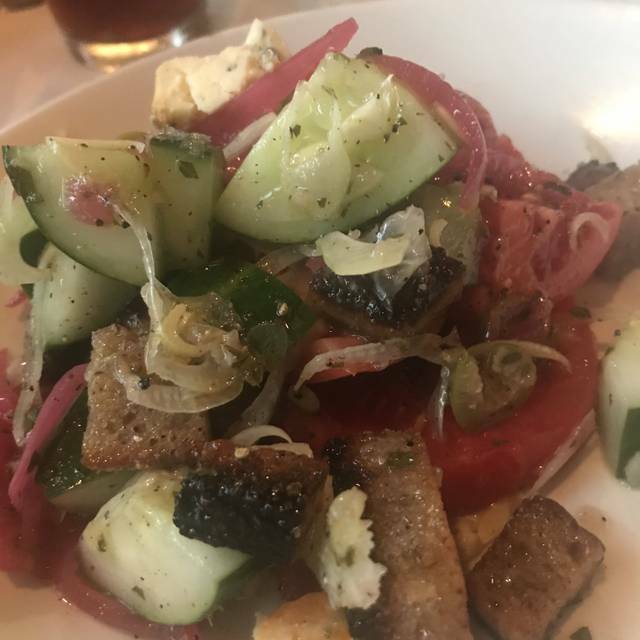 The flavors blended together making this a healthy, and exceptional delicious dining experience. The food and service was excellent as always. The owner came by are table to greet us--Dr. Fritz Kunz He was very personable and kind. Have been wanting to go here for a while and finally made it yesterday. It was a totally enjoyable experience. It was hard to choose with so many unique menu items, but I went with the frittata special and it was delicious. Can’t wait to return to try the grilled cheese. Emily, our server was very attentive and informative. The atmosphere is unique and will be even better in the summer. The only downside was the stairs to get up to the restaurant although I’m sure there was ramp access. We chose to be seated on the porch, thinking the propane heaters would be used. They were not! Uncomfortably cold! Service was good, but pace of the kitchen was slow. Salad was just lettuce. One slice of a radish & cheese was waved over the plate & deemed sufficient. Main courses were good & desserts were very good. Will certainly return when warmer weather is here. As always food was excellent, but service from kitchen was very slow. The scallops were $36 but less than a half plate. They were delicious but not worth it for the price. The Mac n cheese was outstanding, highly recommended. The yeast rolls were also great. We got the toffee ice cream sundae for dessert, it was not that good. I don’t know why it was award winning, if we go back again we will get a shake. It was great. I had a blast my family had a blast. What can I say is that this is truly an inviting homely venue with a lot to offer, families, couples and group gatherings. I would rate this venue as Indiana's best. New spring menu is great. One small downside - don’t plan to get dinner and pop over to the movies, it’s a slow paced place. Beautiful setting, amazing food, great service (ask for Nicole, she’s awesome). We made a reservation, definitely recommended for a Friday evening. There was live music that was really nice and not too loud or intrusive. The only reason for 4 stars instead of 5 is they seated us at a table that is right next to the stairs and hostess stand, and the traffic was a little annoying. In my opinion, there shouldn’t be tables there and I’ll know next time to ask for a different table. Excellent, original menu in a quaint atmosphere with good service. It was very good as usual except the trout had too many things on it. Salads were excellent as were the beets. The trout itself was delicious after I scraped the ingredients off. Terrific space cannot overcome average food at inflated prices. Don't get me wrong, we are not price sensitive but the value proposition for the quality and portions were poor. There is a lack of signage to indicate where the entrance is on the back side of the main building and poor lighting in the parking lot representing a safety issue. At no time during our visit was the entire restaurant full yet we were seated at the worst table in the whole restaurant located 4 feet directly in front of the front door which was drafty and people coming in waiting to be seated kept bumping into my chair. My burger was severely overcooked for which they did offer to replace it, when I declined they comped our desert which was home made ice cream which was extremely grainy as though it had gone through multiple thaw / refreeze cycles. There are too many better options in the area. Always a great place for a good, romantic dinner. One of our favorites. The food was phenomenal!! Everything was so fresh and delicious! Best Burger and Banana Cream pie I’ve ever had!!! Would have had a picture of the pie but we ate it too fast! Everything about this experience was fantastic. The food was great, the setting was more than we could have hoped for, and we got there early so the noise was very low. This is one of my favorite places in Indianapolis. The food is fresh, fantastic and always changing. Service is outstanding and the atmosphere is relaxed. I am never disappointed! Ben was Great!! Just thought the salmon salad was pretty small for the money. Also, you mention so many interesting additions to the lesttuce but in the end hardly anything there. You can definitely up your game. Go try the salmon salad at Stone Creek.. 100 percent better. And the salmon is also beautifully grilled rather than poached. Kind of boring. Wouldn’t order again. Sorry! !